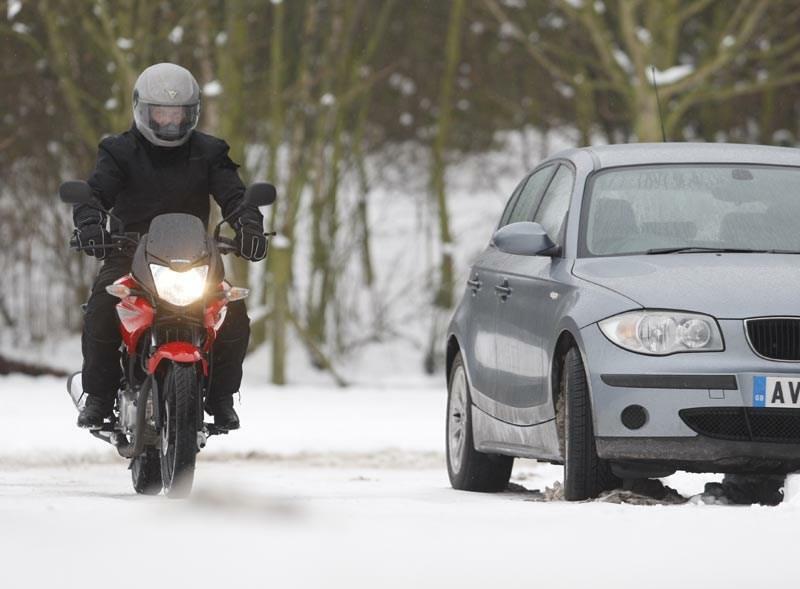 Riding in cold weather can be more dangerous than in hot. As your body redirects your blood to protect vital organs our brains fall into 'emergency-mode' and sensible cognitive thought becomes a battle. So here are our top tips to get you through winter. They're a must. They won't feel like they're doing much but will allow you to carry on using your hands. Breathing in and out through your nose and keeping your mouth closed will minimise the amount of heat you lose. Crucial to staying warm, layers trapwarm air and keep you warmer than using one big jumper. Even at low speeds wind chill can double the physical effects of the air temperature. Use wind breakers. 90% of heat is lost through the head so use a balaclava, just make sure it's a synthetic material or silk. Move around and warm up - it's too easy to kid yourself into 'just another few miles'. Try pushing your bike and you'll soon warm up. Makes great insulation if you stuff it down your jacket and trousers. The simplest tricks are the best. MCN Fleet: Can the XMAX 400 cope with motorway miles? My first 500 miles with the big XT have mainly been a baptism of ice and snow, rather than fire.